Fortunately, the local driving laws in Hawaii are pretty much identical to the laws in any other US state. One notable exception being that it’s required for everyone in the car to wear a seatbelt including those in the back seat. Another notable exception is that a person can get their driver’s permit at only fifteen and a half years old. Other than that, it’s pretty much the same old stuff that you’re used to such as not using a cell phone while driving, no driving under the influence, make a complete and full stop at a stop sign. Parking is, however, a little bit different than anywhere else in Hawaii. As with most heavily populated places/cities, parking can be pretty scarce most of the time, especially during the day and during rush hour. However, where parking differs from most places is that the ability to park in Hawaii is usually demarcated by painted curbs rather than traditional signs. If you see a curb that’s painted red, that means you can’t park there. A curb painted green means you can park there but not long term. If the curb is painted yellow or white, it means that you’re allowed to stop there to unload passengers. The authorities are even more vigilant about parking violations in Hawaii than they normally are elsewhere. So be sure to park only where you’re allowed to. There are also a bunch of common un-written rules of the road in Hawaii as there are in many other places. Keeping honking to an absolute minimum is one of these rules. It’s considered extremely rude and obnoxious. So, as a rule of thumb, only honk if doing so could prevent an accident. In fact, honking is primarily used to say “Hello!” in Hawaii. When opposite sides of traffic are crossing a one-lane bridge in Hawaii, it’s generally accepted that cars will cross in groups of five or so rather than one by one. Keep this in mind to help avoid a potential accident. In general, driving in Hawaii tends to be much less aggressive than the rest of the world. People move at a much more friendly and relaxed pace in Hawaii. There’s a reason that people in places like New York will angrily accuse you of being “on island time” if you’re driving too slowly. When you’re in Hawaii you will want to make sure that you get around to all of the best sights and points of interest. In order to do this, you’ll want to make sure that you choose the best travel routes so you can minimize the amount of time you spend traveling to these different places. 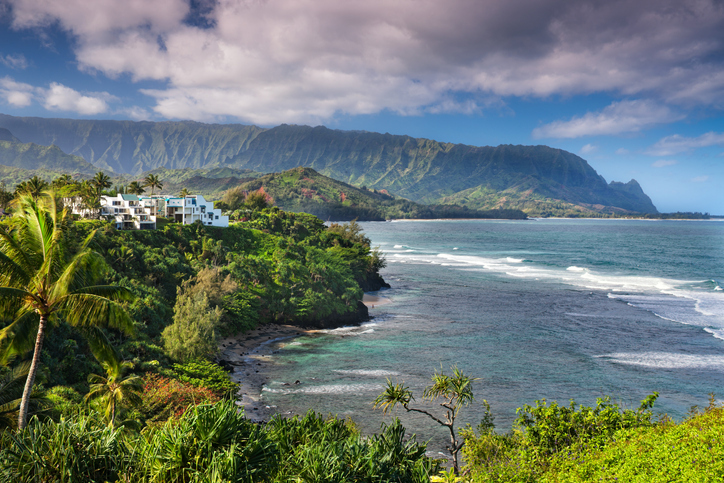 – Full of lush green tropical mountainsides and gorgeous fields, Route 560 to Kee Beach from Princeville is one of the most well-known scenic routes in all of the Hawaiian Islands. This includes a great view of Hanalei Bay which is one the most eye-catching and aesthetically pleasing beaches on the planet. 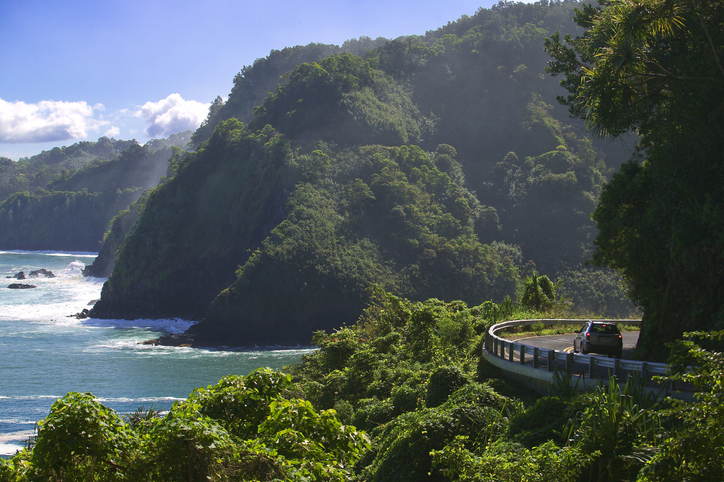 – Easily the most famous scenic route in the state of Hawaii, the drive on Hana Highway to Hana from Kahului almost seems as though it’s made up. 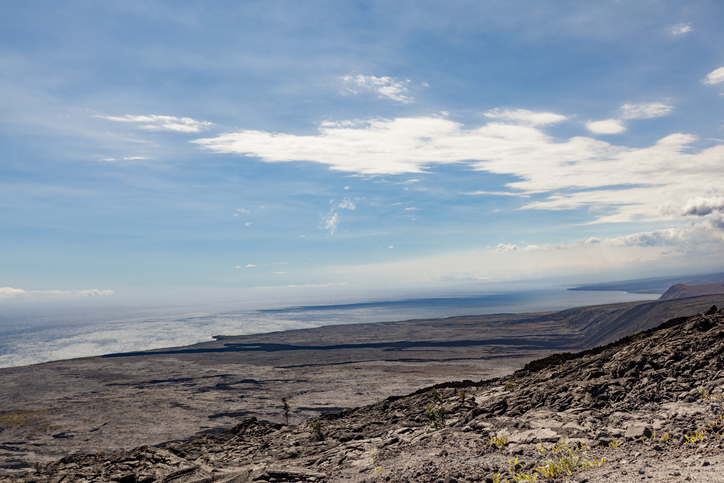 You’ll get the perfect view of Maui’s northeast coastline. 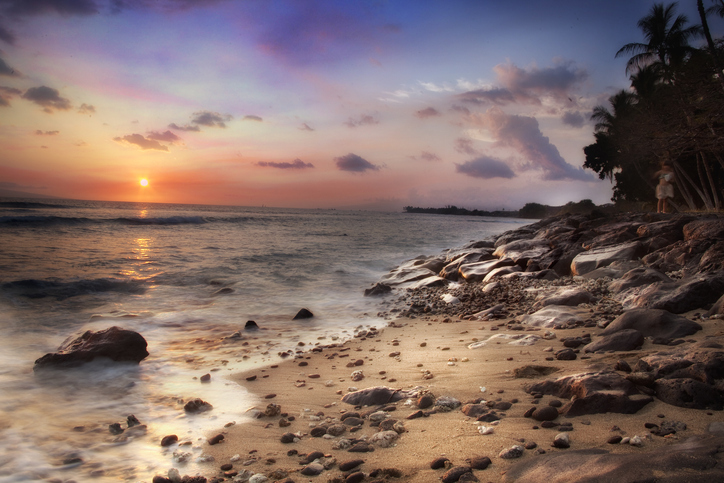 Along the way you’ll pass beaches worthy of being in movies and you’ll have a gorgeous view of the Hawaiian horizon. 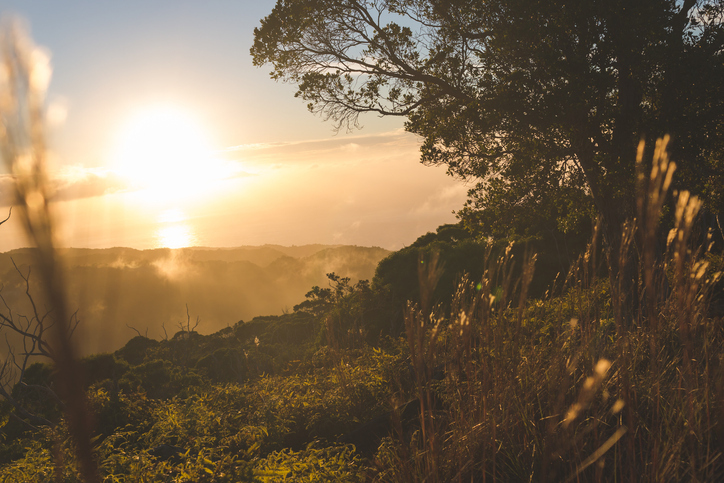 – Definitely one of the best highways to take for breathtaking views such as sunsets, Honoapiilani Highway has a special distinction that has a lot of powerful draw. Along the highway you will have a great ocean view. During the winter and spring months, you’ll have a great chance of seeing some whales splashing around. It’s quite a sight. – A great scenic way to explore the eastern part of Molokai, Kamehameha V Highway is a well-established way to grab a scenic view in Hawaii. Be advised, it can pretty windy on this road. – Another widely popular route in Hawaii, Chain of Craters road is a journey with fantastic views of Hawaii’s Volcanoes National Park. That’s right, it’s essentially an un-guided volcano tour! – With views of Hawaii’s biggest and most breathtaking cayon, Waimea Canyon drive is truly a great sight seeing adventure with all of the places to pull over for a great view. The canyon is an amazing sight with incredible lush green and red forest as far as the eye can see. •	Be on the look out for drunk drivers. Even though drunk driving is strictly against the law and dealt with sternly, some tourists and locals choose to risk it anyway. This isn’t as much of a Hawaiian issue as much as it is a “vacation spot near the beach” problem. Immediately report anyone you see swerving or driving erratically to the police. •	Be careful driving after heavy rains. In rural areas, smaller roads can easily flood or wash out. You don’t want to get stuck out in the countryside during a storm. •	Be careful where you drive your car. It’s easier than you think to get stuck on some of the dirt roads in Hawaii. Towing is extremely expensive there, so do everything in your power to avoid situations where you need to be towed. •	Locals may take advantage of a low amount of traffic and choose to drive in the middle of any smaller roads if there isn’t any oncoming traffic. This is because some roads in Hawaii can tend to be a little narrow, especially rural ones. 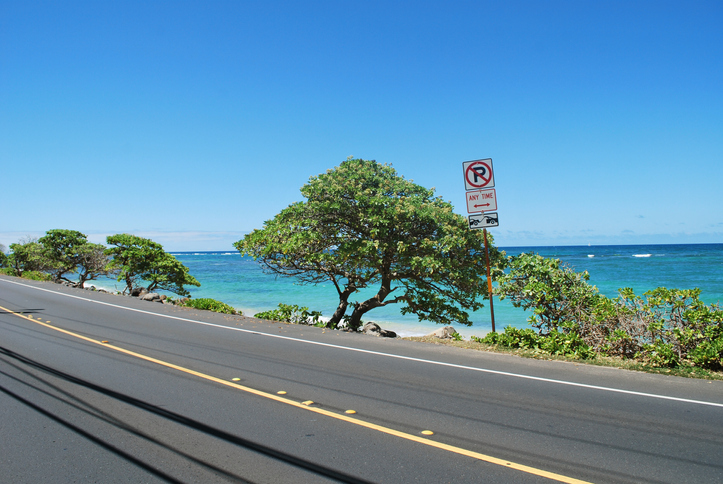 The main thing to remember when you’re driving in Hawaii is that you should take your time. Not just because that’s the custom for driving most people share there but because there are so many amazing sights that you won’t want to miss as well. With those two things in mind, make sure you give yourself enough time to see all these sights at a nice slow pace. Some of the routes mentioned are about fifty miles long, give or take ten or so miles. Travelling these routes, in Hawaii, takes about three hours. This isn’t because of a lot of traffic congestion either. It’s because traffic moves at a much slower pace and there’s a considerable amount of two-way one lane roads on some of these routes. Relax, enjoy your stay in one of the most beautiful places in the world and, most of all, drive safely. If you need a vehicle shipped to Hawaii, Hawaii Car Transport ships to the ports at Honolulu, Hilo, Kahului, Kona and Nawiliwili. Call us today at (808) 445-6695.